Theatre of Upheaval was jointly presented by Canadian Stage, Native Earth Performing Arts and Volcano Theatre. From March 31st to April 5th, a diverse group of 16 interdisciplinary artists gathered to create art that explored our relationships to our dead, and in so doing reaffirmed our connection to life. Under the guidance of Kiki Katese, participants wrote letters to our dead and worked with them as performance material. There was a ‘back to basics’ feeling, as we were reminded that performance is about communication and connection: with the audience, with our performance partners, and perhaps most importantly with the spirits that we invoke within the ritual space of the performance. As we worked on our letters, we experimented with various formats for presentation, but in the end we seemed to come full circle, deciding that each person should simply read their own letter with a minimum of theatrical devices. The result was an eclectic and deeply heartfelt reflection on life, death, family and belonging. Kiki developed her process working with the survivors of genocide in Rwanda. She modified it slightly for working with professional performers here in Toronto. It was a truly powerful experience, reminding participants of the vulnerable human nature which is the source of all our efforts as creators. Working with Ilbijerri Theatre’s Rachel Maza was an experience beyond description. As an Artist, it was everything I needed and everything I didn’t know I needed to wake me up as a writer and performer as we trudge through an uninspiring capitalist society. 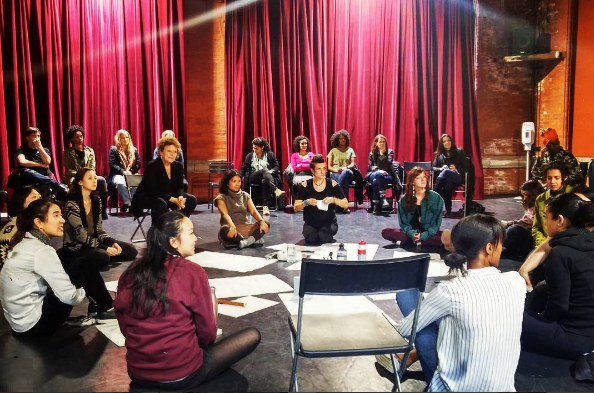 As an Indigenous Artist, it was an emotional, eye-opening, and inspiring journey in a room filled with women-of-colour who share a common struggle in this industry. More than ever, these are the voices that need to be heard onstage and off, not only as actors, but as directors, writers, theatre managers, artistic directors, and in every facet possible. We need to make theatre an accessible medium that goes beyond the western standard. This is how we’ll Rewrite the Narrative of our western society! I cannot thank Native Earth, Volcano Theatre, and Canadian Stage enough for bringing Rachel and her humour, wit, passion, intelligence, and kindness to us. 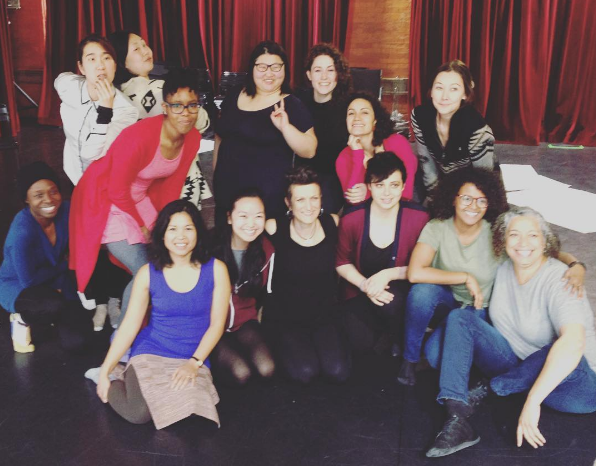 Day 1: This morning I sat in a room that was unintentionally all-WOC and talked about theatre. It was the most fascinating, progressive, inspired, and hilarious conversation and I can’t believe that I have two more mornings with these wonderful women. The future of theatre is now, and it is going to be beautiful. Day 2: One of the many thoughts inspired by today that I am musing: We are struggling to make our voices heard in a dominant paradigm that we did not choose, that does not serve us, that does not work, and is lacking something that the cultures it attempted to destroy and bastardize understood. We have a responsibility to ensure the parts we play, the work we create, and that the audiences we strive to reach subvert this paradigm, and especially to turn the common ‘tropes’ of POC on its head. This is what it feels like to be in the room where it happens! Day 3: Intelligent and goofy women. I am changed. Theatre! Writing! Thank-you for bringing Rachel Maza to us for her first masterclass ever! Theatre of the Upheaval was presented as part of Canadian Stage’s Spotlight Australia Forum Series, presented by TD with support through Toronto Arts Council Strategic Funding. Canadian Stage presents Spotlight Australia from March 29 – May 7, 2017. Founding director of Rwanda Professional Dreamers and Ingoma Nshya (“New Era”) – Women Initiatives. Theatre of Upheaval was a rare opportunity to work outside comfort zones in a risk-friendly environment with two world-renowned creative powerhouses. These workshops invited participation from all kinds of artists looking to expand their horizons and delve into the political undertones of making art.